There’re hundreds of dollars to save. What are you waiting for? Your parents may have washed everything in hot water, but that was back in the day before detergents were formulated to work in cold water. Now, just about all detergents, even if not labeled as such, work perfectly well in cold water. Hot water also fades your clothes and therefore significantly shortens their useful life. Here’s what it costs you to do laundry with hot water, warm water, and cold water. Wash in cold water unless there is motor oil or some other really thick grease on your clothes. ALWAYS rinse in cold water. Anything else is seriously just a waste of your money. If your washer has different settings (based on fabric type, perhaps), simply run a load and use your finger to test the water temperatures for the different settings. Then, in the future, let everyone in your household know that if they do laundry, to choose the setting that corresponds to the cold water. Health tip: make the switch to a chlorine-free detergent. They’ve gotten better and better in effectiveness over the years, and hey, why put those kinds of chemicals on the clothes you and your family are going to be wearing for 16 hours at a time? Or, in the air of your laundry room as they get volatized? Curious how much you could save by switching your wash temp? Let’s take a look: First, let’s assume that your water tank is set to 120 degrees. According to HECO the average family of four does 392 loads of laundry per year. If all of those loads are done using the Hot/Cold setting (which uses 3.4kWh per load) that amounts to 1,332.8kWh per year (392 loads x 3.4kWh per load) factor in the current energy rate ($.3438) and you’ll be spending $458.22 per year on laundry. By switching to the Cold/Cold setting your annual energy usage drops to 156kWh (392 loads x .4kWh) factor in the cost of energy and you get an annual cost of $53.91, or $404.31 in savings! Did you know that your washing machines uses virtually the same amount of energy regardless of how full you stack it? It’s true. So to help reduce the amount of energy your home consumes, be sure to wash full loads instead of multiple smaller ones. You’ll save not only energy and money, you’ll save water as well! Let’s take a closer look at the potential savings from only washing full loads: According to HECO the average family of four does 392 loads of laundry per year. 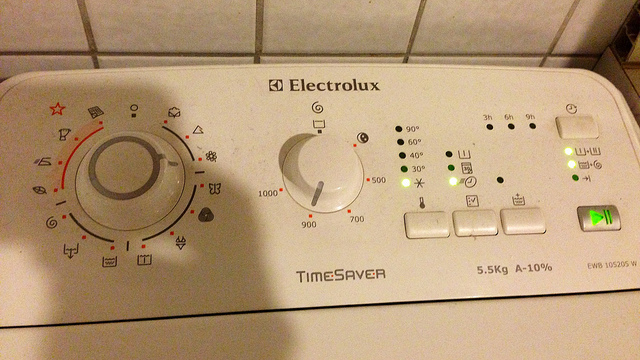 Let’s assume that the washer setting for these loads is the Hot/Cold setting (which uses 3.4kWh with the hot water tank set to 120 degrees). That makes our baseline for savings (392 loads x 3.4kWh = 1,332.8kWh) factor in the cost per kWh ($.3438) and that’s $458.22 per year. Now, let’s also assume that by only washing full loads of laundry you can reduce your total number of loads by 25%. Your new loads per year becomes (392 loads x .75 = 294 loads of laundry per year). 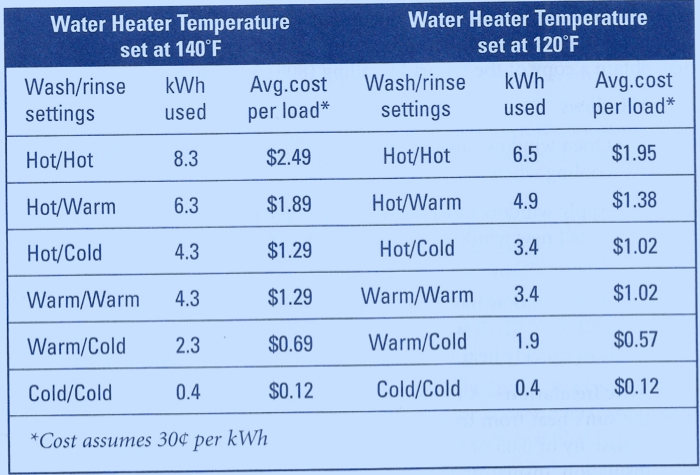 If you continue to use the same Hot/Cold setting outlined above, your new annual cost of laundry becomes (294 loads x 3.4kWh per load = 999.6kWh per year x $.3438 = $343.66 per year for laundry) or a savings of $114.56 in savings! Your clothes dryer represents thousands of dollars in savings…just waiting to be had. If you have one of those utility meters with a spinning wheel in it, go watch it the next time someone is using the dryer…the site of that wheel spinning around like a wheel on a Tour de France bike should be enough to convince you that there must be a better way. The first thing to do is embrace a really awesome clean tech innovation: solar powered clothes dryers. Brace yourself, I’m referring to clotheslines (and in-house clothes drying racks, for folks who don’t have the outdoor option). 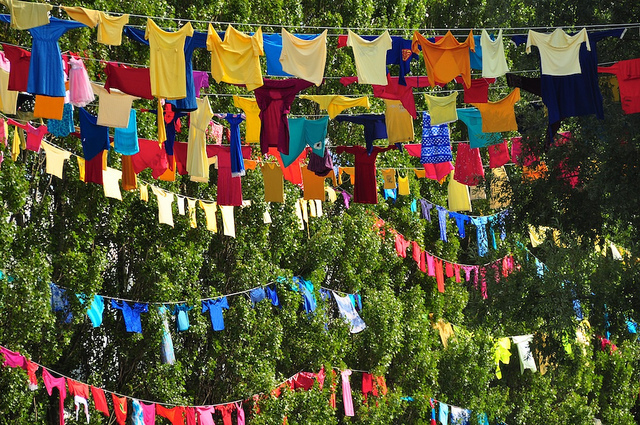 The average family, switching to hanging clothes to dry, can save more than $363 per year. If you’re in need of a either a drying rack or clothesline, you can snag one or both of them from the Pono Home Store! 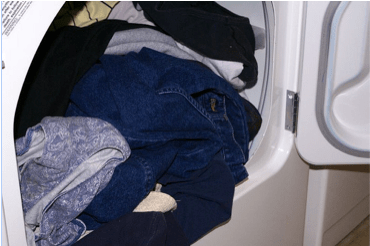 A closer look at the savings associated with line-drying: According to HECO the average household dryer consumes 1,056 kilowatt hours per year, which when multiplied by the energy rate on Oahu ($.3438) comes out to $363.05 per year. Which is money you could be saving if you switch to a drying rack or dry line. if your dryer has one. That will assure that when your clothes are dry, the dryer will turn itself off and not spend a bunch of extra electricity to continue drying your already dry clothes. If you don’t have an auto dry setting, set the dry time to less than you’d expect it to need, and turn the buzzer on so you can check it when it’s done. Turn it on for a few more minutes if need be. Make sure the setting you choose is for the appropriate fabric (otherwise you will damage your more sensitive clothes). 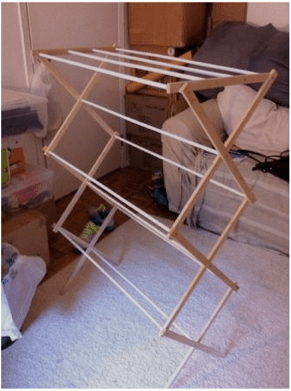 But, seriously…get a drying rack. Indoor, foldable drying racks take up little to no space and pay for themselves in no time. And use no energy whatsoever, and therefore, help you reduce your carbon footprint. 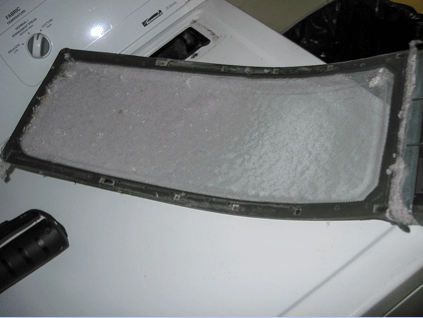 Be sure to clean out the lint from your dryer’s lint screen between uses. This will help to ensure good airflow and keep your dryer working efficiently. Clogged lint can be a fire hazard in your home, as well as a general health challenge for people sensitive to dust, so do it for the earth, and do it for yourself. You can save about 10% of the overall cost of running your dryer by making sure the lint screen, lint trap, and lint vent are cleaned out regularly. Check out this article from The Inspired Economist to learn how. Let’s take this one step further: So if by keeping your dryer lint free you can save 10% on its energy usage, and according to HECO the average dryer consumes 1,056kWh per year, your new annual usage by keeping the lint screen clear is (1,056kWh x .9 = 950.4kWh per year) factor in the cost per kWh ($.3438) and that’s an annual operating cost of $326.75. Which when compared to the cost of not cleaning the lint screen ($363.05) means you’ll be saving $36.30 per year! 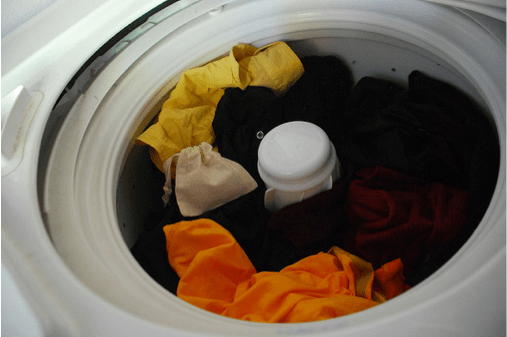 While clotheslines and foldable drying racks can save you a ton of money, if you still want to use the dryer, there are ways to reduce the amount of money it’ll cost you. Using the auto-dry setting will ensure that the dryer kicks off when clothes are dry. If your dryer doesn’t have an auto-dry setting, try drying your clothes for less than a full cycle. We suggest roughly 40 minutes, odds are this should be long enough to completely dry all your clothes. If not, just pop them back in the dryer for another 10 minutes or so and repeat till they’re dry. You can always add drying time, but you can’t take it away. Let’s take a look at how much you could be saving every year by drying for less time: According to HECO the average family of four uses 1,056kWh per year for drying clothes. Let’s assume that they’re over drying their clothes every time, meaning they’re drying them for a full hour (1.0hr) vs 40minutes (.67hr). By adopting the tip above the total power consumption for drying clothes per year becomes (1,056kWh x .67 = 707.52kWh per year) factor in the energy rate ($.3438) and the new cost per year for using the clothes dryer becomes (707.52kWh x $.3438 = $243.25) compare that to the original cost of over drying ($363.05) and that’s a yearly savings of $119! The following photos are courtesy of Flickr Creative Commons (clothes on a clothesline, clothes in a washer, dryer settings, lint screen and clothes in a dryer) and Pono Home.